The BBD Launch: This took place on 19th October at Uganda Museum. The speakers included Achilles Byaruhanga (ED NatureUganda), Moses Mapesa (Former ED Uganda Wildlife Authority), Paul Mafabi (Commissioner for Wetlands of the Ministry for Natural Resources), James Lutalo (Commissioner for Wildlife Conservation) and Dr Andrew Seguya (ED Uganda Wildlife Authority). The guest speaker Mr. Moses Mapesa assisted by Dr. Chris Bakuneta of Makerere University gave a presentation about "the role of birds as biodiversity indicators, a conservation tool and eco-tourism product". Click to download the presentation (PDF). Vision’s Group photojournalist Mathias Mugisha was also recognized for his patriotic role as a nature photographer. He exhibited a number of bird photographs. Participants registered for the areas that they wanted to visit and carry out the birding exercise. The Big Birding day: This was on 20th October. Birding took place in 47 birding sites across the country including 12 sites in Kampala area. The sites included national parks, wildlife reserves, forest reserves, Ramsar sites, Important Bird Areas (IBAs), Kampala city neighborhoods, private homes and compounds. Over 300 birders in 58 teams were involved in the 2012 birding exercise. The Big Birding Festival: This took place on 20th October at Botanical gardens in Entebbe where the birding results of the 20th Oct exercise were announced. The festival kicked off with a nature walk in the morning followed by merry making and entertainment celebrating the achievement. The target for 2012 was 700 species (66%). The teams covered 35 general areas and recorded 657 species. This accounts for 63% of the total species of Uganda recorded and an increase of 82 species from the 2011 record. We recorded 386 in 2009, 622 in 2010, 569 in 2011 and 657 in 2012. Finally the tallies for birds that can be recorded in one day in Uganda continue to increase as well as participants and sites covered. 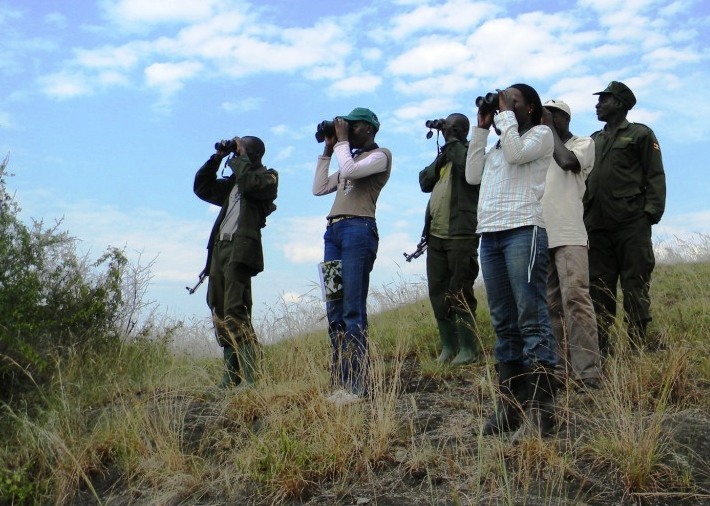 We look forward to more participation and believe that as people continue to enjoy bird watching, so will their attitudes change towards nature conservation. This will not only help to tame rampant environment degradation and species declines but will also ensure that Uganda continues to benefit from sustainable utilization of its resources. The organization of the BBD events is done by a National committee made of NatureUganda partners that come together to plan and fundraise for the BBD events. Over the years, these have increased in number to the list below.